With Luis Suarez’s departure for Barcelona and Iago Aspas’ likely exit from Anfield, per James Pearce of the Liverpool Echo, as it stands Liverpool’s senior forward options to start the new season are Daniel Sturridge, Fabio Borini and new signing Rickie Lambert. On paper, a far cry from Suarez and Sturridge’s 52-goal partnership last season, which did more than just prove prolific: Their pace, movement and dynamic creativity struck fear into the hearts of opponents up and down the country. With Alexis Sanchez, originally a target to be included in Suarez’s deal with Barcelona, having joined Arsenal, Liverpool have missed out on arguably one of their most attainable forward options in the summer transfer window. Yet as Brendan Rodgers continues his scour for striking talent across the world, all is not lost: In Rickie Lambert, he has a talented, all-round striker who will be giving his all upon a dream return to his boyhood club. And as the Reds fight on four fronts this season, whether they sign a new first-choice partner for Sturridge or not, Lambert might well have it in him to chip in with 20 goals in all competitions. Out goes one half of the famed SAS partnership; in comes another to replace him. Life goes on. Suarez may be a once-in-a-generation kind of talent, and his performances last season certainly elevated him into the echelon of the greatest players ever to have played for Liverpool, but there was another "S" that blossomed last season, also with Rodgers' coaching. That player, of course, is Raheem Sterling, who, having spent almost a full season in the Liverpool first team and forcing himself into the PFA Young Player of the Year candidate pool, will be looking to take off and reach his full potential. From being whispered in conjunction with a loan outside of Anfield to starting for England in the World Cup within just a few months, Sterling showed rapid enough progression last season to potentially win over even the toughest critics. He showed a turn of pace and the dribbling technique to rival Sturridge's, and his vision, work rate and interpretation of space perhaps even exceeded the No. 15's. With Rickie Lambert in the side, Sturridge and Sterling will be flanking him as the focal point of the Reds attack. Lambert's first touch, close control, passing, positioning and chance creation will no doubt play a pivotal role in setting the platform for the new SAS to thrive. In return for the space that he helps put them into, their pace and off-the-shoulder runs will occupy the attention of enough defenders to create enough space for Lambert himself to get into. And Lambert is as cool, calm and collected in front of goal as anyone in the Premier League. For all of the assists that Suarez laid on for his team-mates last season, he was the undisputed individual star of the team, who frequently passed to him and relied on him to bail them out of trouble or get through a sticky patch. That is no criticism. Far from it; it is merely an acknowledgement of the individual brilliance that he brought to Liverpool, who will undoubtedly be worse off from a magical game-changer point of view. Yet as hard as Suarez might've been to mark, potentially still harder is Liverpool's collective movement that will be on display this season. Three years into Rodgers' reign, his team finally look confident and comfortable enough to carry out his tactical and positional plans, and it's no surprise he has signed players this summer that will help his team achieve that as a collective. Adam Lallana, Lambert's captain at Southampton, may always be considered overpriced at a reported £25 million, per Andy Hunter of The Guardian, but he dovetailed with Lambert to great effect at the Saints and will offer plenty of movement between the lines in Rodgers' system. So too the effervescent Jordan Henderson and the underrated Joe Allen, as well as the electric new signing Lazar Markovic. If there is a style of play that Lambert thrives in, it is one that is based on sound movement and intrinsic understanding of each other's positioning. And not only will Lambert be a creator of goals just like his team-mates; he will also score them. 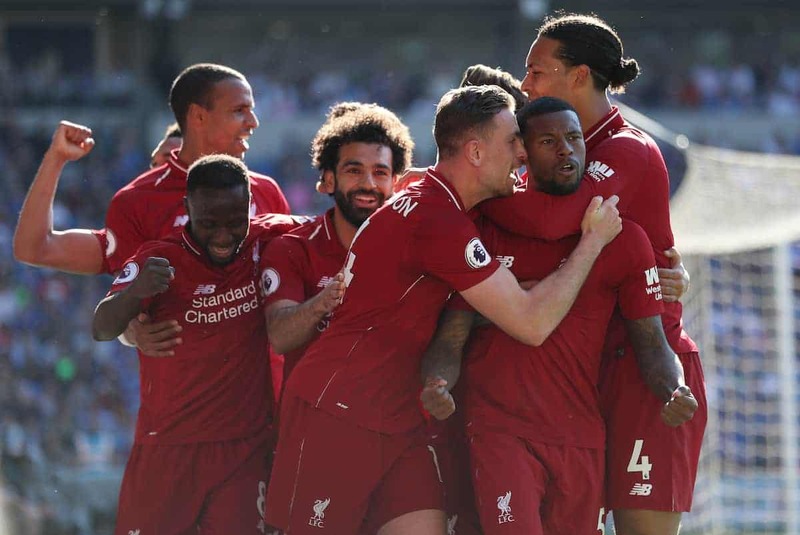 There is also the small matter of set pieces, and Liverpool, with pace and technique coursing through their side, are one of the most prolific set-piece winners in the Premier League. Not to mention one of the league's best at scoring from them. And adding Lambert into the equation will only help things. First, for all the talk about Lambert's technical ability, passing and close control, he remains a fine option in the air. He might not be quite as aerially dominant as Anfield flop Andy Carroll, but his positional intelligence and timing more than makes up for it. Getting Lambert on the end of a Steven Gerrard corner or free-kick would be a quite sumptuous prospect for Reds fans. Then there are direct free-kicks, another area of expertise for Lambert, who has scored a few screamers for Southampton in his two-year Premier League journey with the Saints, including one against Crystal Palace last September. Suarez's exit has deprived Liverpool of a strong alternative to Gerrard on free- kicks, but Lambert may prove just as prolific from range. Finally, Rodgers' squad will be strengthened by the addition of another composed mind from the spot. With 48 penalties scored from 49 attempts over the course of his career, Lambert is arguably one of the finest penalty-takers in the Premier League; his record eclipses even that of regular specialist Gerrard. Could he even usurp his new captain on penalty duty? Regardless, Lambert's versatility and well-roundedness offers his boyhood club a valuable option up front, both off the bench and from the start. In a team that creates chances in abundance and almost oozed goals last season, even without Suarez, Lambert stands to thrive. An improvement on his total goal tally of 17 across all competitions last season might not be too far-fetched.